I was out in the neighborhood on September 14, 2016, for my daily walk. Up N.W. Kaiser Road, then along a path through Hansen Ridge Park, then to the intersection of N.W. 147th Street and the power line right-of-way. At this intersection a sign was posted months ago. 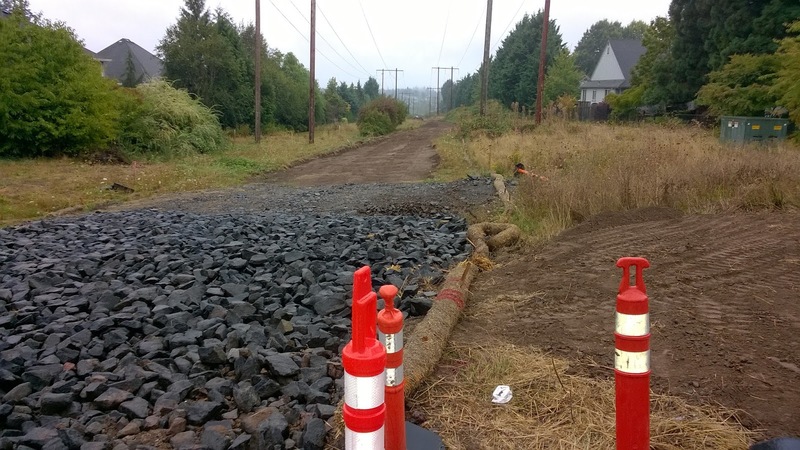 It announced that Tualatin Hills Parks and Recreation District is extending the regional Walking Trail. "Fantastic! I won't have to walk on sidewalks anymore. I'll be walking through grasslands, past blackberry bushes, under trees, over Bronson creek on the new trail! Bring it on!" Those were my thoughts. A work crew posted the sign announcing the trail construction month ago. Recently, trucks have arrived occasionally. One truck unloaded a portable toilet. Another left a load of long, black plastic pipes, rigid and some as wide as 36 inches. 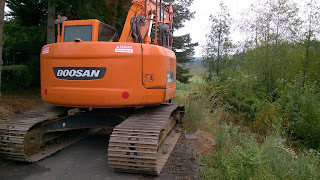 Finally, a week ago, a large, orange backhoe appeared. 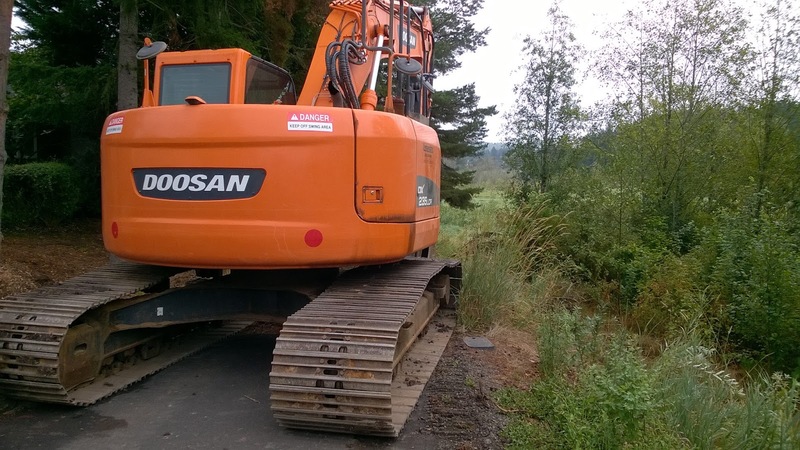 This backhoe machine is no toy! It was a sign to me that serious work on the trail bed would begin soon. On September 14, I saw two saw two construction workers--a man and a woman--standing by the orange backhoe. They were just waiting, apparently, for something or someone, so why not talk with them? "Good morning," I said. "Oh hi," one replied. It was an invitation to chat. The woman (I'll give her the name "Cindy") was especially open and chatty. The man stood by and smiled. I'd describe Cindy as light in build and blond in hair color. She wore no hat; her hair was braided. Age? Hard to say but I'd guess in her late 'twenties. We talked briefly about the work in progress. I thanked them for their work on the trail, then I walked on to my usual goal: a community tennis court a block away. After touching the fence, I walked back along the same route. Before I could see the backhoe I could hear it. When I got close enough I saw that Cindy was up in the cab, wearing her hard hat on and operating the machine. She guided the shovel to scoop up the grass and blackberries and to excavate eight inches of earth, preparing the bed of the ten feet wide walking path. The man was in the role of swamper. He assisted Cindy by point out surveyor stakes marking the boundaries of the path and by pulling some junk off to the side of the trail-bed. The sight just amazed me. I've been a sidewalk superintendent for decades and I've never seen a woman backhoe operator, not until September 14. From the speed that Cindy had that machine moving dirt and debris she was a skilled operator. September 16 and on my daily walk again, I stopped at the construction site. The activity had moved two blocks up the power-line right-of-way. A different woman worker was standing there, but no Cindy in sight. I asked whether Cindy was working. The woman told me that Cindy and the backhoe were blocks away, up over a rise and down on the other side. Whoa! ", I said. "She's really moving!" The woman told me that Cindy was qualified to work all the large power machinery present on the trail construction site. Cindy. the backhoe operator, symbolizes women moving ahead in the workforce in a whole variety of roles formerly reserved for men by custom or regulation. Think of Janet Yellen as Chair of the Federal Reserve Board. Hillary Clinton as the leading candidate for President of the United States. Chancellor Angela Merkel, head of the German government. Women in C.E.O. positions in private corporations. High profile symbols of success. Progress for all workers, men and women. According to Ned Davis Research via Charles Schwab Corp., real average hourly earnings of All Workers has increased from $10.25 per hour to $10.71 per hour from March 31, 2016 to July 31, 2016. That's an increase of 4.5% in "real" (inflation-adjusted) terms. Women are sharing in the rising income. Great to have met Cindy and to think of her as a symbol of society's success in erasing some old barriers. "A living wage and equal pay for men and women." I'm a witness to greater justice in the workplace. Please be part of the greater justice crusade, Click one of the Share buttons just below.